Having concentrated on its weather duties for the past twenty years, the Signal Corps had fallen behind in the field of military communications. Although the Army still used flags and torches to convey information, the rapidly developing technology of the late nineteenth century carried communications into the electrical age. The growing sense of professionalism both in society at large and within the Army, along with the concomitant specialization of functions, finally gave the Signal Corps the sense of mission and identification for which it had long been striving. The emergence of the United States as a great power in the wake of the War with Spain found the Signal Corps providing communications around the globe. Finally, the legislation specified that the Corps' operations would be "confined to strictly military matters." While Congress thus defined the Corps' mission more explicitly than in previous legislation, it still left a considerable area open to interpretation under the category of "other duties usually pertaining to military signaling." The legislation set the Signal Corps' strength at one brigadier general, one major, four captains, four first lieutenants, and fifty sergeants. The United States Army had to catch up with its European counterparts, most of whom had by now successfully employed field telegraphy. The British Army, in particular, made extensive use of field lines while fighting a series of colonial wars in Africa.4 After the long period of neglect, the telegraph train began to receive some attention. To provide more opportunities for practice, Greely sent trains to Fort Grant, Arizona; Fort Sam Houston, Texas; and the Presidio of San Francisco to supplement those at the Infantry and Cavalry School at Fort Leavenworth and the Cavalry and Light Artillery School at Fort Riley. While coping with such circumstances, the Signal Corps constantly sought more efficient methods to perform line repair and maintenance. In keeping with the bicycle craze then rolling across the nation, the Corps found its own uses for the velocipede, as it was then called. Bicycles provided a faster and more economical means for making repairs. In the time it took to secure a horse and wagon, a linesman could jump on his bicycle, repair the line, and return to his station. The Corps also began adapting the bicycle to lay and take up wire. The replacement of wooden with iron poles also lessened the damage caused by deterioration or fire.10 In addition to the frontier land lines, the Signal Corps had retained control of the cables in San Francisco Harbor that linked its fortifications to the mainland. While state forces made progress, the federal government hesitated. Throughout the 1890s Greely expressed concern about the Army's shortage of trained signalmen. As in the past, the system of instruction at the various posts had not proved very successful. The departments were not devoting enough time to signal training for the men to become skilled. Moreover, the line soldiers who were detailed for signal training would probably be needed by their own companies in the event of combat. Although the Corps had been able to provide sufficient numbers of signalmen during the Pullman riot in Chicago, Greely worried that, in the event of a more serious emergency, there would not be enough experienced men available. Therefore, in both 1894 and 1895 he recommended to the secretary of war that fifty privates be added to the branch. In 1896 he increased his request to four companies of fifty men each.30 But his pleas for additional personnel went unanswered. In addition, two of the Corps' allotment of ten officers served on detached duty until the outbreak of the War with Spain. Maj. H. H. C.
Dunwoody (promoted to lieutenant colonel in 1897) remained with the Weather Bureau while Capt. George E Scriven served as the military attach� to Rome. Thus, as the United States moved toward its first conflict on foreign soil since the Mexican War, the Signal Corps had available only eight officers and fifty men to provide the necessary communications. A new national commitment would be required to create an army that was ready for war. The sinking of the Maine in Havana harbor in February 1898 precipitated the crisis. When Spain failed to respond to diplomatic pressure, Congress declared war in April of that year. While it proved to be a "little" war, lasting only a few months, the nation emerged from the conflict as a world power. The war also provided a glimpse of the impact that the technological innovations of the era would have on the nature of warfare. Before the fighting was over, the Signal Corps demonstrated that it could link the Army electrically with its commander in chief thousands of miles away. much-needed equipment.35 Upon enlistment, these men reported to Washington Barracks, D.C., for training in signal techniques and military drill. There they were organized into companies of approximately four officers and fifty-five men each. Despite the wording of the legislation setting up the volunteer corps, the companies were not assigned to divisions, but were consolidated at corps headquarters (generally three to a corps) for distribution as the commanding general saw fit.36 Due to the short duration of the conflict, most of these companies did not serve overseas but instead performed communication duties at the various mobilization camps. 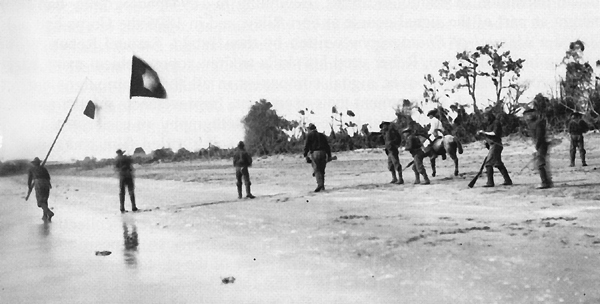 Among the Signal Corps' first operations was the outfitting of an expedition to cut the underwater telegraph cables that connected Cuba with Spain and to establish cable communication between American forces arriving in Cuba and the United States. The Corps, however, had no ships in its inventory, and the Navy had purchased all the submarine cable available in the United States. With the help of officials of the Western Union and Mexican Telegraph companies, Greely chartered the Norwegian ship Adria, outfitted it, and secured a small amount of cable. 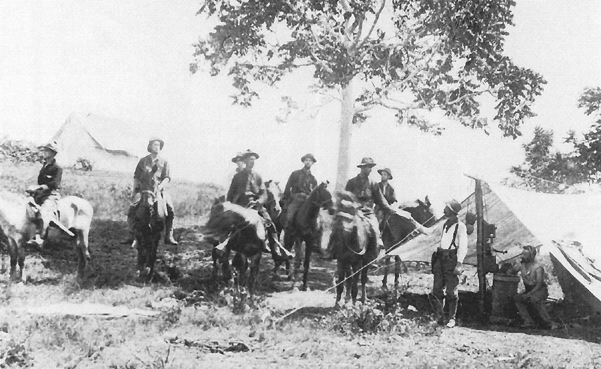 The Mexican Telegraph Company provided the necessary cable gear. When ready, the Adria sailed from New York to Key West where it came under the command of Allen, by now a lieutenant colonel. A major problem arose, however, when the captain and crew of the private vessel balked at the hazardous nature of the mission. Eventually they agreed to sail, but the experienced cable handlers hired for the job refused. To replace these men, Allen received three Signal Corps sergeants and, at the last minute, ten privates from the 1st Artillery at Key West. Unfortunately, only one of these men had ever been to sea before, and none had ever seen a cable. Nevertheless, the Adria set sail on 29 May and arrived off Santiago on 1 June to begin destruction of the three cables believed to connect Cuba with the outside world. If General Shafter had gotten his way, such electrical communication between the front and Washington would have been impossible. When his signal officer, Maj. Frank Greene, tried to persuade him to take signaling equipment to Cuba, Shafter replied that he only wanted soldiers with guns on their shoulders.42 Shafter's attitude notwithstanding, Greene and his signalmen accompanied the V Corps to Cuba and maintained flag communication between the ships of the fleet during the voyage. Despite the Signal Corps' ability to provide electrical communications, Shafter refused to allow the field telegraph train to be sent to Cuba. Once ashore, the folly of this decision became apparent, because the island's dense vegetation severely inhibited the use of visual signals. They were employed, however, to communicate with Sampson's squadron offshore. The Army thus would have been dependent on messengers to communicate between its commands had not Greely foreseen the difficulties. Before the Adria sailed, he had taken steps to obtain electrical equipment, insulated wire in particular, and loaded it aboard for Allen to use in Cuba. Since the Spanish enjoyed the benefits of both telephonic and telegraphic communications, the Americans would have been at a great disadvantage without them. 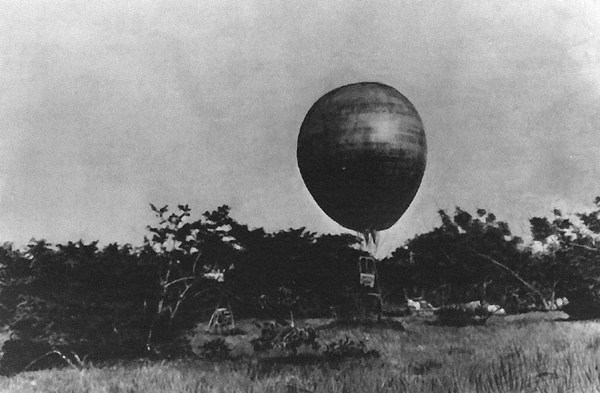 Once in Cuba, the balloon remained aboard ship for a week waiting to be unloaded. In the steaming hold, the varnished sides of the sphere stuck together. When Shafter finally called for a balloon reconnaissance before attacking the Spanish defenses outside Santiago, he denied Maxfield's request to unload the gas generator. 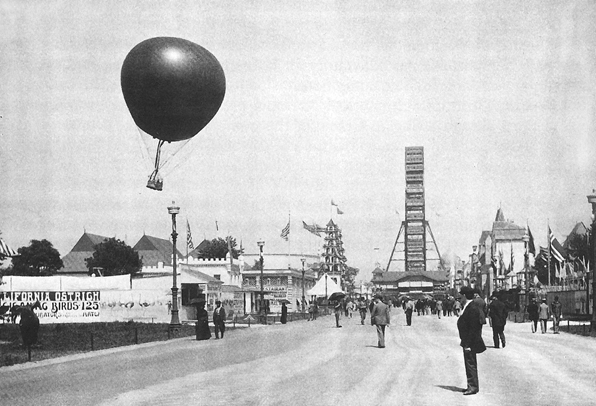 Thus the balloon would have to depend on the gas brought along in storage cylinders-enough for only one inflation. the balloon, shrapnel and bullets rained down upon the troops below, resulting in numerous casualties. Maxfield and Derby escaped injury, but one member of the detachment received a wound in the foot. The balloon, meanwhile, was torn apart. Even if the holes could have been repaired, the signal detachment had no reserve gas available for reinflation. Although the Americans suffered heavy casualties during the fighting on 1 July, the Spanish had been more seriously harmed. The subsequent destruction of Cervera's squadron on 3 July in a desperate dash for freedom signaled the conclusion of the Santiago campaign. Shafter laid siege to the city and, after threatening to attack, forced the Spanish to surrender on 17 July. General Greely on 27 July 1898. Companies A and D saw their first service in Puerto Rico. The other four signal companies that served there belonged to the volunteer corps. These six companies were organized into two provisional battalions, one commanded by Lt. Col. William A. Glassford and the other by Lt. Col. Samuel Reber, who later became Miles' son-in-law.47 Both Glassford and Reber held volunteer rank during the conflict. Merritt's force sailed from San Francisco on 25 May, stopped along the way to occupy Guam, and arrived in Manila on 30 June. According to the terms of the peace treaty signed with Spain in December 1898, the United States acquired the islands of Puerto Rico and Guam. Spain further agreed to American occupation of Cuba and the annexation of the Philippines by the United States, for which Spain received $20 million in compensation. With the Hawaiian Islands, also annexed in 1898, the nation now held significant overseas territories. The Signal Corps' aeronautical activities, however, did not fare as well. Although the Dodge Commission did not address the issue in its report to the president, the Corps' handling of the balloon received considerable rebuke, especially from members of units exposed to the fire it had drawn. One of these units was the 10th Cavalry, in which 1st Lt. John J. Pershing served as regimental quartermaster. Caught beneath the balloon, the 10th Cavalry received, in Pershing's words, "a veritable hail of shot and shell. "58 According to Pershing, no one in the line knew the balloon's purpose, and the only intelligence furnished by its occupants was "that the Spanish were firing upon us-information which at that particular time was entirely superfluous. "59 The novelist Stephen Crane, reporting on the war in Cuba, wrote of the balloon's "public death before the eyes of two armies. "60 Aeronautics was still a largely unexplored area of Army operations, with no clear-cut doctrine yet developed for its use. Despite the mixed results in Cuba, the Signal Corps continued to explore the possibilities of airborne observation and reconnaissance in the postwar period. The acquisition of foreign territories by the United States carried with it increased duties and responsibilities for the Army. With the end of the war, soldiers could not return to business as usual, because the nation had become a major power. For the Signal Corps, its mission now included the administration of the communication systems in the Caribbean and the Pacific, in addition to its domestic duties. posts, by April 1899 the Signal Corps had completed a 600-mile telegraph line from Havana to Santiago, or practically from one end of the island to the other. The Corps also built a new telephone system for the city of Havana and laid two cables in Havana Harbor. 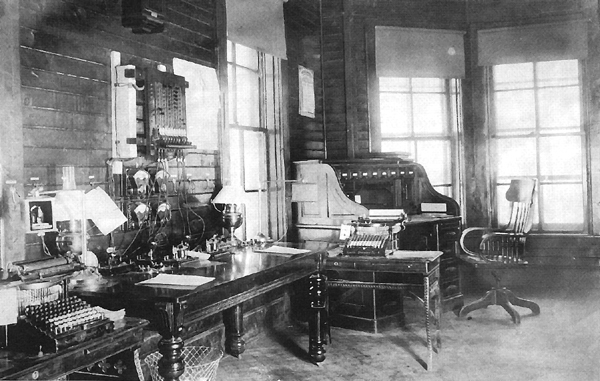 In addition to filling the Army's communication needs, the Signal Corps transmitted commercial business over its system. 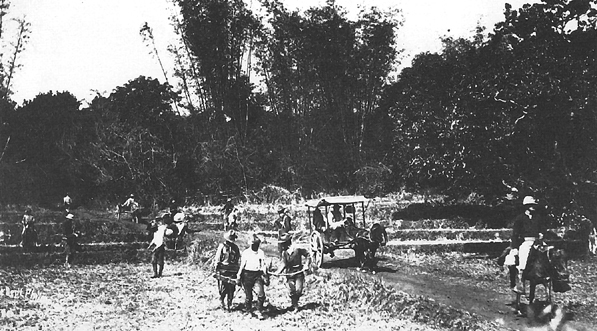 To meet the demand, the Corps constructed a second line between Havana and Santiago. In the Philippines, meanwhile, a new war was brewing. Tensions had steadily increased between the Americans and the Filipino insurgent forces; their leader Aguinaldo had organized a provisional government for which he sought recognition. When it became clear that independence would not be forthcoming and that the United States would replace Spain as the ruler of the archipelago, Aguinaldo began an active resistance. On the night of 4 February 1899 fighting broke out around Manila, the beginning of what became known as the Philippine Insurrection. as from other units. Each company operated with a division, forming detachments as needed for a variety of duties. The 18th Company, serving with Maj. Gen. Arthur MacArthur along the railroad from Manila to Dagupan, became railway dispatchers. As the volunteer signal units were gradually mustered out, Regular Army units replaced them. small numbers of soldiers and armed civilians, were soon besieged by a much larger force of Boxers and Chinese imperial troops. fully thousands of miles from home. By providing the necessary communications support, the Signal Corps contributed significantly to the nation's rise as a world power. 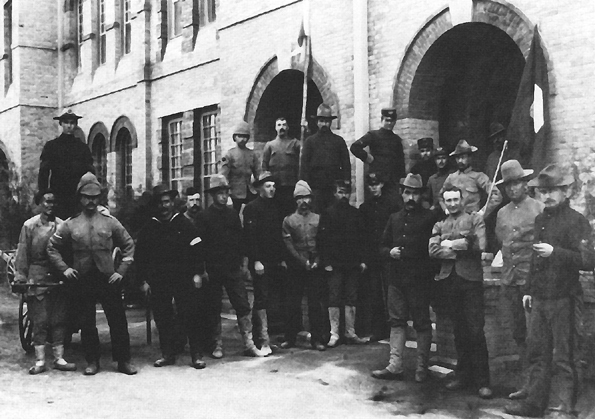 Meanwhile, signal training also underwent some changes, as Fort Myer once again became the home of the Signal Corps in 1899.84 The branch returned to centralized training and discontinued the schools at Fort Logan, the Presidio of San Francisco, and San Antonio, Texas. Individual signal instruction at the departmental level, while still mandated by Army regulations, could not be relied upon to produce skilled signal soldiers, as previous experience had demonstrated. 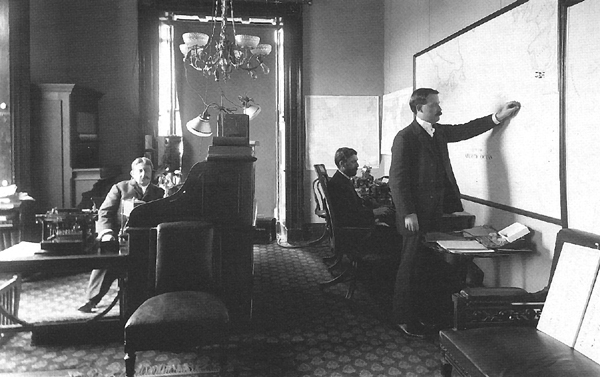 In fact, the War Department had made matters worse by amending the regulations in 1899 to require only such instruction as the departmental commanders "deemed necessary for the public service," rather than the previously required two months' worth.85 Moreover, the Corps had been unable to furnish a signal officer to each department to oversee the instruction. Recruits sent to Fort Myer received training in telegraphy, telephony, line repair, and visual signaling. While six months of training was preferable, the demand for signal soldiers in the field limited it to as few as four months. Once telegraph operators achieved a competency of twenty words per minute, they served as assistants on the military telegraph lines in preparation for duty overseas. Officer-level instruction was also conducted on a limited basis. In addition to its training function, the post became a depot for supplies being returned from the various Signal Corps posts, domestic and overseas. Although the Signal Corps remained earthbound for lack of a gas plant, the year 1903 witnessed several significant events in aeronautical history. In October and December, Samuel P Langley made two unsuccessful attempts to launch his so-called Aerodrome, a machine that resembled a giant dragonfly. A few days after his second failure, the Wright brothers flew successfully at Kitty Hawk, North Carolina, on 17 December. Their achievement remained virtually unknown to the world at large for several years because the Wrights avoided publicity pending the receipt of a patent for their airplane. Nevertheless, above the windswept dunes of the Outer Banks, a new age of flight had begun. While the telegraph and the telephone had dramatically improved communications, a new technology began to make its appearance-wireless telegraphy, or radio, as it became known. This new form of communication had been demonstrated in Europe by Guglielmo Marconi, an Italian inventor and entrepreneur. Although others had discovered the principles of radio, Marconi successfully exploited its commercial potential. He brought his system to the United States in 1899, where he used it to report the results of the America's Cup yacht races held that fall.89 Radio had many advantages over the visual, wire, and cable systems then in use. For example, it was not limited by hindrances to visibility such as darkness or fog. Moreover, with the Army and the world at large becoming more mobile through the introduction of motorized transport, radio had the ability to go where wires and cables could not. Radio had particular application for communication from ship to ship and between ship and shore. Its availability during the War with Spain might have dispelled some of the confusion between Sampson and Schley concerning Santiago. Still, in the early twentieth century, "radio" simply meant the transmission of Morse dots and dashes through the air. The technology for the wireless transmission of the human voice and music had not yet been developed. York Harbor, followed by Fort Mason and Alcatraz in San Francisco. In May 1899 Squier traveled to London to study under Marconi.91 While wireless still had many "bugs" (it could be easily intercepted by the enemy, for example), the Signal Corps had taken the initial steps toward launching this new form of communication. In 1899 the War Department created the Department of Alaska, with headquarters at Fort St. Michael on Norton Sound. To establish communication links, Congress in 1900 authorized construction of the Washington-Alaska Military Cable and Telegraph System (WAMCATS) and assigned its supervision to the Signal Corps. 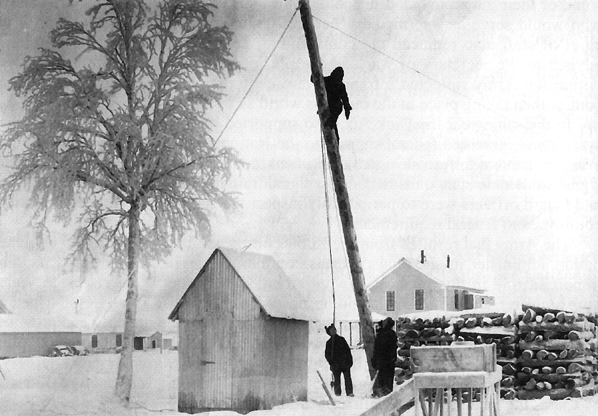 The new lines would connect the nation's capital to the military posts and the posts to one another as well as serve the commercial telegraph needs of the territory.93 The Alaskan system, in fact, became the last in the chain of frontier telegraph lines to be built by the Signal Corps. After enduring service in the tropical climes of the Caribbean and the Philippines, signal soldiers now faced the opposite extreme. As in the tropics, the environment itself would present one of the most formidable obstacles to progress. In Alaska, featureless tundra and treacherous muskeg swamps replaced jungles as natural obstacles, while the accompanying temperatures plunged as low as -72 degrees Fahrenheit. In the summer when the weather moderated, hordes of mosquitoes plagued the linesmen, and forest fires posed an additional hazard. 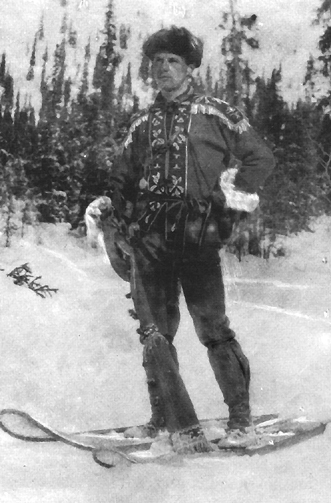 Funds from the initial appropriation of $450,550 became available in June 1900, and Greely hurried to secure supplies so that work could begin before winter. The first detachment of men from Company D, Signal Corps, under 1st Lt. George C. Burnell, landed at Port Valdez on 9 July. By August, when most of the equipment had finally arrived from the United States, construction parties had taken the field. Difficulties in finding suitable routes for the line and the onset of winter slowed the rate of progress, and Greely expressed concern that the system would not be completed before Congress cut off the money. The chief signal officer, who had himself strung thousands of miles of wire early in his career, could apply his considerable experience to the task at hand.